July 7, 2018 By This post may contain affiliate links. 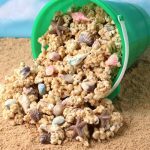 Fill up your beach pail with crunchy Peanut Butter Popcorn that’s coated in sandy looking cookie crumbs and speckled with homemade chocolate sea shells. 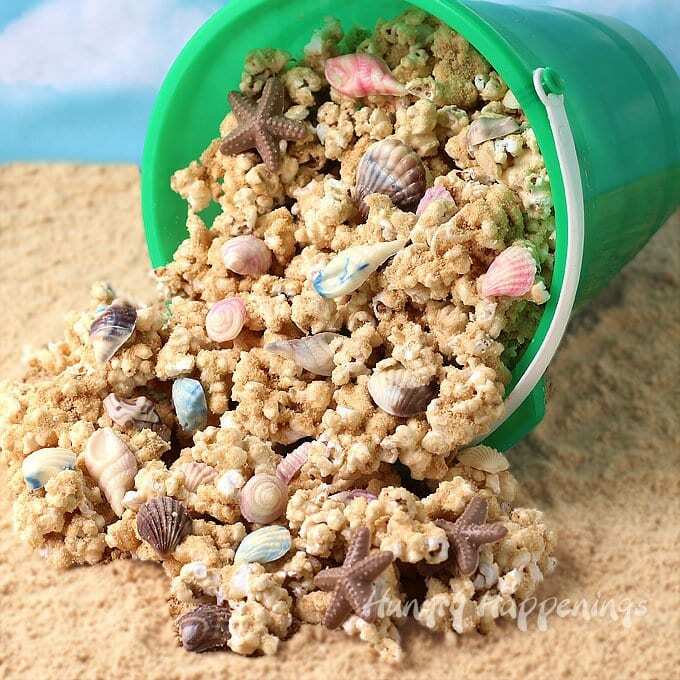 This Beach Party Popcorn will make a festive treat for your pool party or beach themed events. Post originally published on July 5, 2016. Update with video tutorial on July 7, 2018. I made this fun Peanut Butter Popcorn Speckled with Chocolate Shells for my nephew’s beach themed graduation party and it was one of his favorite treats on the dessert table. I love mixing peanut butter into my white chocolate popcorn. It adds a creaminess and lovely peanut flavor that is heavenly. Being there were so many desserts served at the party, there was still popcorn in the pail at the end of the event. My nephew and his friends finished it off later that night and he told me how much everyone enjoyed it. What’s not to love about creamy peanut butter blended with white chocolate tossed with popcorn and some cookie crumbs? Oh, and the added sweetness of homemade chocolate sea shells and starfish made the sweet snack even better. 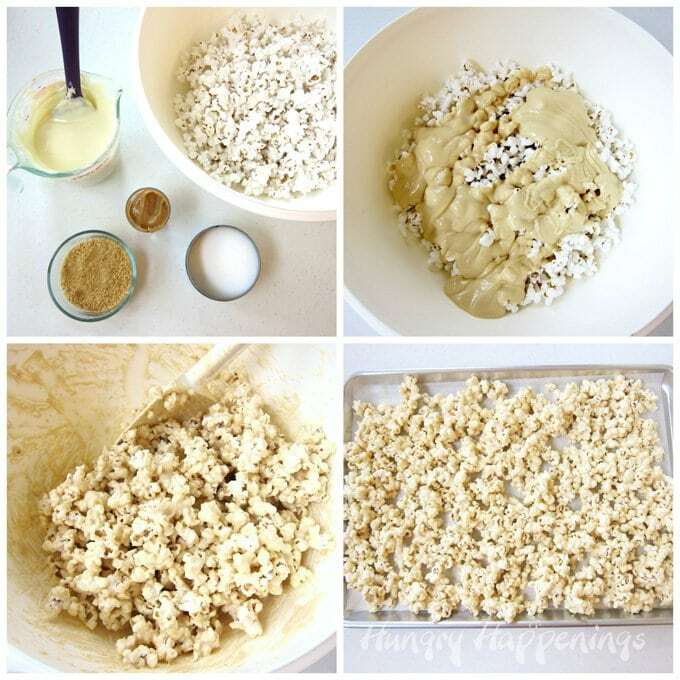 If you are having a beach themed party or a pool party, then this peanut butter popcorn recipe is a must. 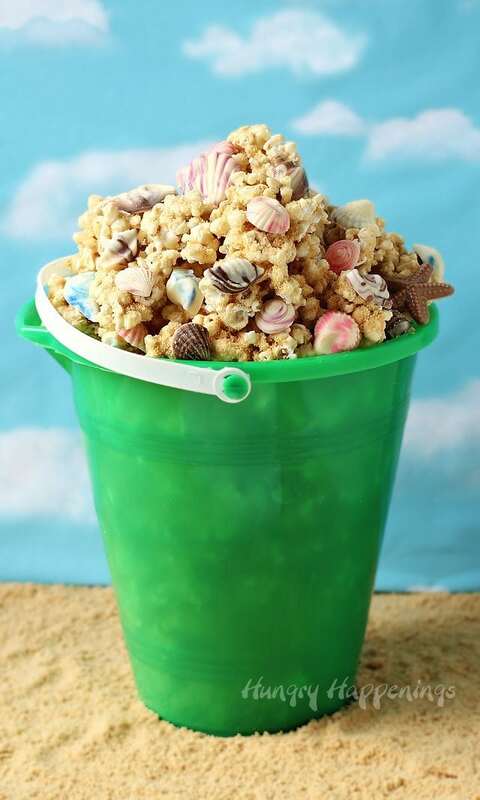 The Beach Party Popcorn looks great served in a plastic pail, but could simply be served on a flat tray or in a big bowl too. It would even be fun to display the sandy looking cookie crumb coated popcorn around a beach themed cake or under a stack of beach cookies. One of the best things about this recipe is it’s simplicity. To make this popcorn you can use pure white chocolate or white confectionery coating (candy melts.) You can find detailed information about melting these two types of white chocolate on my Chocolate Making Tips page. Melt and temper pure white chocolate or simply melt white confectionery coating. Use any brand of pure white chocolate if you are practiced at tempering. If you do not temper pure white chocolate it won’t harden properly and your peanut butter popcorn will be a bit sticky. I personally don’t bother tempering white chocolate when making my peanut butter popcorn. I like to use Peter’s White Caps. It has a lovely white chocolate flavor and can be melted in the microwave. On occasion I will melt Nestle White Morsels and use them instead. They have a very similar flavor to the Peter’s White Caps. Once melted they are quite thick though, so if you use them in this recipe, you might want to add another 1/2 – 1 tablespoon peanut butter to thin it out. A few other options would be to use Wilton White Candy Melts, White Almond Bark, Merckens White Coating, or Ghirardelli White Melting Wafers. Once you’ve melted the white chocolate, you’ll stir in creamy peanut butter and a pinch of salt. Use your favorite creamy peanut butter. I chose JIF. A pinch of salt will help intensify the peanut butter flavor if you are using air popped popcorn. If you are using microwave popcorn that is already salted, you can leave the salt out. You’ll need to reserve a small amount of the peanut butter “chocolate” for later, so scoop 2 tablespoons into a small bowl. Then pour the rest over the popped popcorn, and quickly, but gently, toss to coat. I use air popped popcorn, but any plain popcorn will work just be sure it isn’t loaded with greasy butter as that makes it difficult for the white chocolate to adhere. Just mix until the popcorn is evenly coated. If you mix too much the white chocolate will start to harden making it difficult to spread out onto the pan. 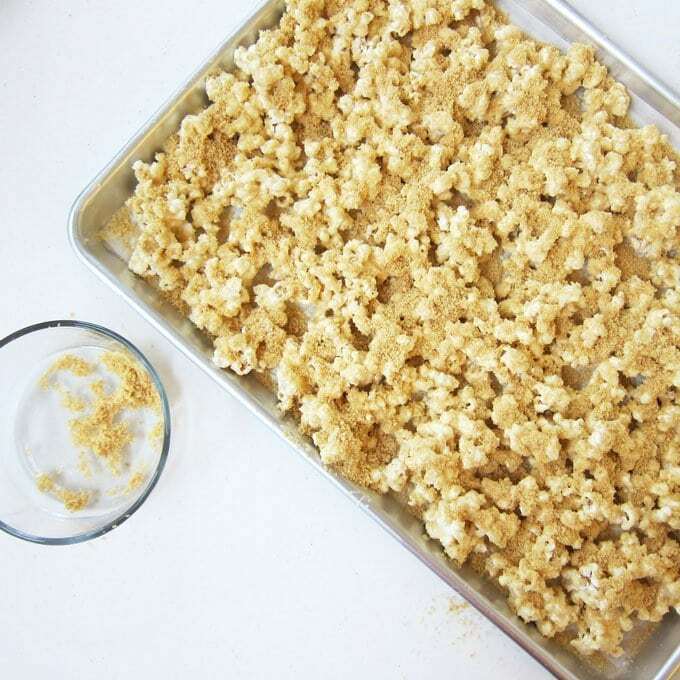 Pour the popcorn out onto a parchment paper lined baking sheet and spread it into an even layer. Immediately, while the chocolate is still wet, sprinkle cookie crumbs all over the popcorn. I crushed up some store bought butter cookies to sprinkle over my popcorn, but any tan colored cookie or graham cracker will work fine to create the look of sand. If you want to really intensify the peanut butter flavor of this popcorn, you can crush up peanut butter cookies. Pop the pan in the refrigerator for 10-15 minutes until the candy coating hardens. Remove it and break the popcorn into chunks. 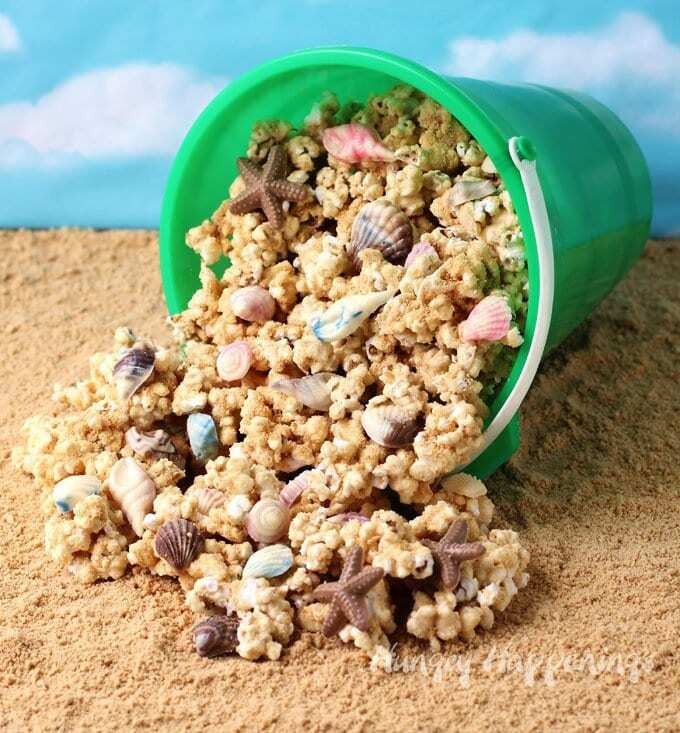 Use the reserved peanut butter “chocolate” to attach either homemade chocolate sea shells and starfish or store bought candy shells to the popcorn. You may need to reheat it in the microwave for a few seconds if it has hardened. I’m not that quick. The white chocolate coating will begin to harden quite quickly and I couldn’t get all the shells attached and sprinkle on the cookie crumbs while the chocolate was still wet. I wanted to break the peanut butter popcorn up into small pieces before attaching the shells so the shells wouldn’t pop off as I broke up the popcorn. I realize it takes time to attach each individual shell, but I think you’ll like the look if you do. You can even pile the peanut butter popcorn in your pail before attaching the shells if you want to really arrange them perfectly. You can find the recipe and step-by-step tutorial for making the chocolate sea shells, here. 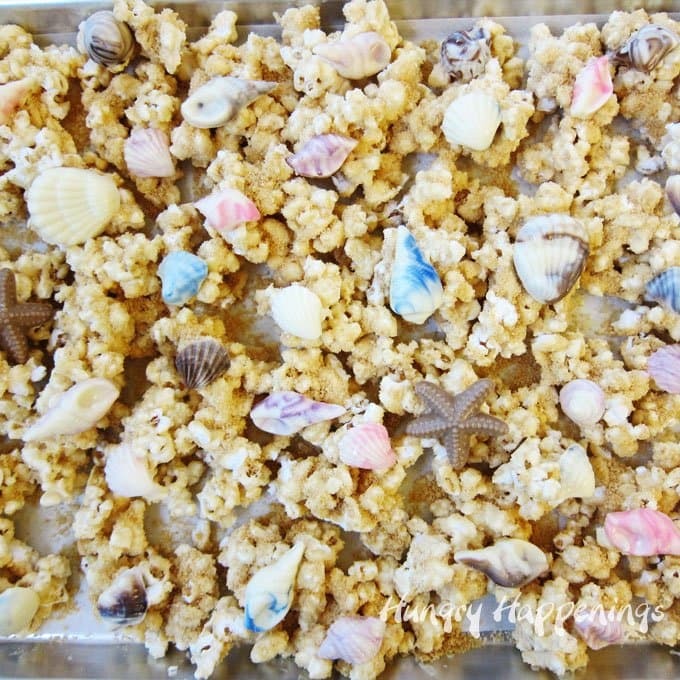 Creamy peanut butter white chocolate coated popcorn sprinkled with cookie crumbs makes a fun sandy beach on which to attach chocolate sea shells. 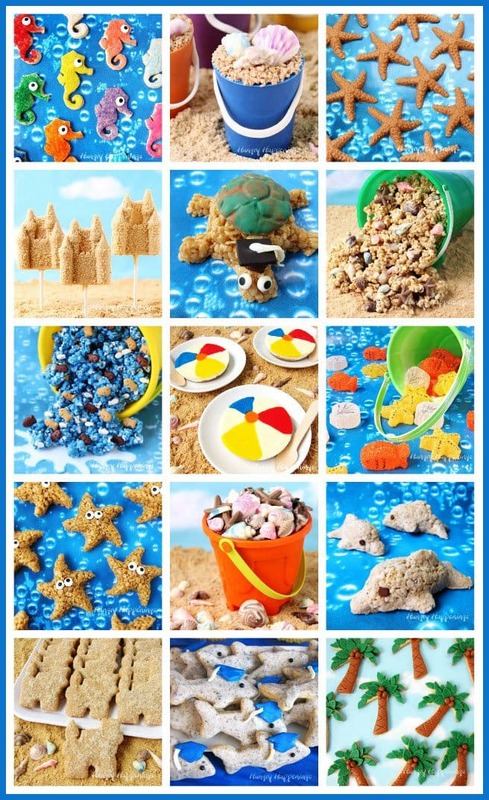 This yummy treat is perfect for a beach or pool party! Pour the popped popcorn into a large mixing bowl. Stir in creamy peanut butter and a pinch of salt into the white chocolate. Reserve 2 tablespoons of peanut butter chocolate mixture for later use. Pour the remaining chocolate over the popcorn. Spread into an even layer on a parchment paper lined baking sheet. Remove and break popcorn into chunks. Reheat the reserved peanut butter chocolate then use it as glue to attach chocolate shells to the popcorn. and/or tag @HungryHappenings on Instagram and send me a picture so I can share it in my Readers’ Gallery. Wow! This turned out amazing, love it! The cookie crumbs are such a great touch. Thanks so much. The cookie crumbs not only add the sandy look to the popcorn, but they add a nice flavor too. What a FUN idea, I love the look of the popcorn, not to mention the fact it’s peanut butter. I just made a bag of sugar cookie sand for a project and now I know what to do with the leftovers! Thanks! This is my new favorite popcorn recipe. I hope you give it a try. One question: the recipe above says 2 tablespoons of peanut butter, but the directions say to “reserve 2 Tablespoons.” How much pb do you stir into the white chocolate? Add 2 tablespoons of peanut butter to the white chocolate then reserve 2 tablespoons of the peanut butter white chocolate mixture to use later. Enjoy! I love anything beachy and your popcorn is perfect! Your video tutorial is great and I love the way you painted inside the bag to mimic the look of a real shell! I can see why this was your nephew’s favorite! I’m so glad you enjoyed the video. Painting in the pastry bag is a clean and easy way to swirl the colors. I hope you give it a try!